With only weekends available to travel around studying at university, some of my trips have felt rushed over the last few months, e.g. I only spent one day in Lisbon and one in Sintra before it was time to leave. On top of this, I have come back on many occasions to Salamanca at 3am in the morning, after uncomfortable night coach/train journeys, exhausted. Spending five days in Porto allowed me to visit the city at a slower pace, take a few day trips (Guimarães and Aveiro) and rest when I needed to, which allowed it not just to be somewhere else to visit, but also a bit of time-out to relax. Porto, just like most places in Portugal, is extremely hilly, and I have returned feeling like I have had a good workout. I traveled by Blablacar on the way with two French Erasmus students studying in Madrid and a Polish Erasmus student in Salamanca, which was fun. The drive was much more direct than the six hour coach journey I took yesterday on the way back to Salamanca. I stayed at Gallery Hostel, which is highly rated on TripAdvisor. I’d 100% recommend staying there, I had an absolutely fantastic experience and had no complaints at all. They go above and beyond to make your stay enjoyable! Porto is currently a whole 10 degrees centigrade lower than Salamanca (Porto is 20-24), so it was a comfortable temperature to explore the city in the day, no jacket necessary and then something light on top if you are out at night. Coming back to Salamanca, I was hit with the heat, it has warmed up so much since I have been in Porto! What always confuses me is the time difference between Portugal and Spain (Portugal is one hour behind) and also the fact the Portuguese like to eat their evening meals earlier (8:30pm rather than 10pm) – although I prefer this, it is so strange when coming from Spain, where restaurants don’t open until 9pm! Also, tap water is actually drinkable in Portugal, so it felt weird to be filling up my water bottle from the tap, instead of buying those massive 5L water bottles from the corner shop in Spain. In all honesty, although Porto is a fantastic city to visit, I have to hold on to the feeling that it in no way compares to Lisbon, which is in a league of its own – I am just so in love with Lisbon, it is hard to beat! 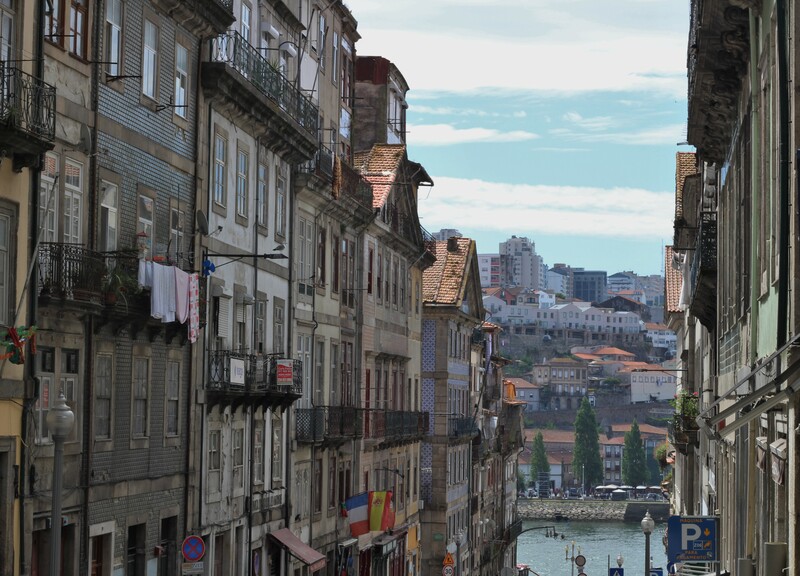 I love walking around cities but whenever I walked around the streets of Porto, I could go from a very touristy area, turn a corner and suddenly enter a very dodgy neighbourhood without warning during the day. Then I would turn another corner and be out in the clear again. And the fact that everywhere is so hilly, I could only escape at a certain pace without collapsing from exhaustion. These pockets of unsafe areas come without warning and I’d say they are difficult to avoid unless you stick to the main streets, but if you do that, you will also miss some of the most beautiful panoramic views and buildings in the city. During the evenings I never was out on my own, I always made sure I was with others. This is just the one thing I felt uncomfortable with during my trip, but nothing bad actually happened. This is just a general update about what I have been up to. I will be uploading a post soon about the highlights of my trip to Porto next time – there were quite a few interesting ones.